Ten players from the HWU academy and National Talent Squad attended the Irish Junior Open, held over Friday 27th November – Sunday 29th November, under the watchful eyes of Martin Woods, Kevin Moran and Susan Fitzsimmons. After a very early flight on the Friday morning, the squad arrived at the hotel and were immediately off to the club to prepare for our first matches. 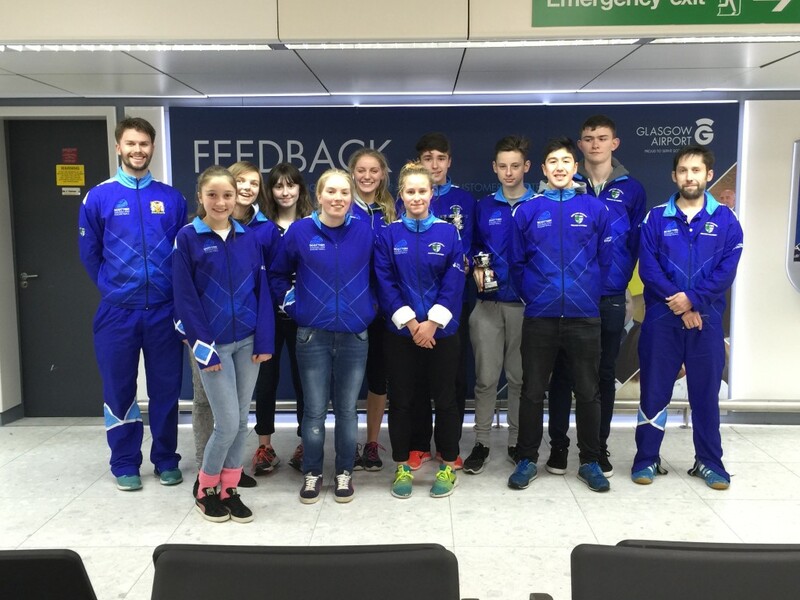 Day one gave the Scots contingent a good start to the tournament. In the girls under 13 tournament, Jemma Young despatched Emma Dineen from Ireland in straight games. In the girls under 15 event, Orla Young secured a solid victory over Irish opponent Mia Maher and Katie Gregson-McLeod had a solid 3-0 win in her first match of the day over Kate Horgan from Ireland. Unfortunately Katie then ran into the very strong second seeded American girl Marina Stefanoni and lost her second match 3-0. Maddie Orr was unfortunate in her first match to meet Emma McGugan from Ulster, and despite fighting hard, eventually lost in a tight 3-1 that could have gone the other way on a different day. In the Boys under 15 event, Alasdair Prott, Chris Murphy and John Meehan all secured 3-0 wins to take them into the next round on day two. In the Boys under 13 event, Finlay Martin had a superb start to the day first beating Hugh Duignan from Ireland in an epic five game match and then Ed Gaffney also from Ireland, 3-0 to reach the quarter-finals. Although not officially with us, Beth Moglia had one of the stand out Scottish performances of the weekend in her second match on Friday. Beth faced the strong number two seed from England, Jasmine Tranter, finally coming out on top in an inspiring five game battle. Beth took a commanding 2-0 lead by playing incredible length and following it up with her dangerous short game. Jasmine fought back well in the third and fourth and with the aid of a few questionable decisions she managed to get it back to 2-2. Beth came out in the 5th game looking very motivated and produced the best squash of the match. She played a tactically sound game, and did so with a fantastic attitude. In the Boys under 17’s Fraser McCann got off to a flying start taking the first two games reasonably quickly against Brian Collins from Ireland. The Irish player fought back well though, taking the third 11/8. In a pivotal fourth game which could have gone either way, the Irish player edged it 13/11 to level the match at 2 all, and then despite trying hard Fraser couldn’t break the momentum of play and eventually lost 8/11 in the fifth. The girls under 19 draw proved to be of no help to our two players Katriona Allen and Carrie Hallam, who ended up meeting each other in the first round, with Carrie winning 3/0, but Katriona playing well and almost taking the third game. Fin Martin entered the quarter finals early on Saturday morning against the second seeded Alex Smith from Ireland, and tasted defeat for the first time of the tournament, losing 3-0 in a good encounter. In his second match of the day, Fin had an epic encounter with Jake Creaven from Ireland. The match was always very tight, with Fin going 1-0 and 2-1 up, but a decisive fourth game saw the Irish player claw it back to 2-2 in an unbelievably tough tie break, and then going on to take the fifth 11/8. Despite losing, Fin showed great spirit and composure and will gain much from the experience of the match. Beth Moglia had a convincing win in her only game of the day, beating Ireland’s Emma Dineen 3-0. Jemma Young played well in her first match of the Saturday, clinically beating Lauren L’Estrange from Ireland 3-0, but had a much harder second match against Jasmine Tranter from England. Jemma played really well, but found it tough to make headway against the older and stronger English girl, and despite losing 3-0, made her higher seeded opponent work for the win. In another early match, Alasdair Prott beat David Maier from Leichtenstein in a comfortable manner, 3-0. Alasdair had a tougher semi-final match, facing the 3/4 seed Sam Buckley from Ireland. Despite the Irish player managing to level the match at 1-1, Alasdair’s consistency provided the Irish player with a lot of work to do and although he fought well, Alasdair closed out the match in four games to reach the final. Chris Murphy met the Hungarian Tamas Devald in his first match, winning in a four game encounter, to take him into the other semi-final, where he met the No.2 seed, Conor Moran from Ireland. This was a tough match, and Chris struggled to beat the Irishman’s driving game, eventually losing in straight games to go into the 3-4 playoff on the Sunday. John Meehan had the misfortune to meet Conor Moran in his first match on the Saturday, and despite playing well, lost to the stronger player in three. The second match of the day was also tough for John, losing to the higher seeded Michael Creaven in three games. Looking slightly out of sorts before the match, John fought well to make the match very tight at the end, but left himself just too much to do to overturn the two game deficit. Orla Young had two excellent wins on the Saturday, first of all beating Ireland’s Emma Lundy, then taking on the number one seeded player for the event, Selena Georgiev from Bulgaria. This was also a contender for match of the tournament. The match to and fro’d, with Orla going 1-0 down and then 2-1 down. Into the fourth Orla had renewed vigour and took the game 11/3 and it seemed her opponent had finally tired, however the Bulgarian showed great fighting spirit taking the final game all the way to the wire, with Orla emerging victorious 15/13 in the fifth! Having had a rest day on the Friday, the tournament started on Saturday for Richard Hollins, up against Andes Ling from Hong Kong. The Hong Kong player proved slightly too consistent for Richard, who despite some sublime play to the front court struggled to get a hold on the match. Richard took the first, but then lost the next three to go down 1-3. Richard met Ireland’s Philip McSweeney on the Saturday afternoon, and after going 2-1 down, showed some great ability to take the next two games 11/7, 11/4. Patrick O’Sullivan also met a tough opponent in his first round, playing Isaac Rawcliffe from England. Patrick took the first game 13/11, but was made to work hard for it by the Englishman. Some gamesmanship was employed by Patrick’s opponent, trying to upset Patrick’s rhythm, and despite rallying well and fighting hard, Patrick eventually lost 3-1. In his second match, Patrick had an easier opponent in Karl McLoughney from Ireland, and despite dropping the third game, never looked in danger of losing. Maddie Orr had an excellent 3-0 win against Ireland’s Rhiannon Telford on the Saturday morning, playing some excellent squash in the process. Katie Gregson-McLeod also had a good 3-0 win over Sasha Zheleznyak from Ireland, setting her up to play Maddie in their last match of the Saturday. In the all Scottish match-up, Katie played well, and despite Maddie fighting hard, Katie won this time round in three games. In the girls under 15 event, Emma Fitzsimmons had a tough first match against Laura Neil from England, losing 3-0, but won her second match against Lily Lloyd from Ireland in a convincing 3-0. Fraser McCann had a tough day at the office on Saturday, who despite fighting valiantly, lost both his matches 3-1. Carrie Hallam met the top seed for her event in the semi-final, Elin Harlow form Wales. Carrie lost the first game 7/11, but fought well to take the next game and level the match at 1 all. The next game was tight all the way, where Carrie fought well to contain the volleying and lobbing game of her wily Welsh opponent, but lost in the tie break 10/12. Despite moving and playing well, the girl from Wales managed to keep Carrie on the back foot to close out the next game and therefore the match 3-1. Carrie played exceptionally well and looks to have all of the skills she needs to make the transition into the senior ranks in the near future. Katriona Allen faced Hong Kong’s Jannis Lam in her second match, and struggled to impose her game on a speedy and clever opponent. Despite being 2-0 down, Katriona played a near perfect third game to claw it back to 2-1, but couldn’t quite sustain the tactics needed and lost the fourth game to lose 3 -1. Fin Martin had another early start, playing Jack O’Flynn from Ireland in the playoff for 7-8th place. The Scot took a very tight first game with only two points separating the two players, but the hard matches from earlier in the tournament showed in Fin’s legs as the Irish player took the next three games for Fin to finish in 8th place. Next up was the final of the Girls under 15 event with Orla Young playing the American girl, Marina Stefanoni, seeded two in the event. From the very start it was obvious that Orla was going to have a very hard time of it, and quickly went two love down. Orla fought well in the third and made better headway against her extremely accurate and consistent opponent, but finally lost the third game 6/11, and finishing runner up in the girls Under 15 event, having only just turned 13 the previous month. John Meehan had a good finish to his event, beating Dean Dromgoole from Ireland 3-0 to finish 13th overall. In another contender for match of the tournament, Chris Murphy had an exceptional finish to his event on Sunday, defeating Sam Buckley in straight games. In what can be a tight encounter between the two players, Chris won 12/10, 11/7, 11/9. Overall a great performance from Chris who showed just what he’s capable of. Emma Fitzsimmons faced Sophie O’Rourke from Ireland in the 3-4 playoff. Losing the first game 7/11, Emma looked comfortable in the match and came back to win both of the next two games 11/9. The fourth game proved to be the crucial game in this match. The game was finely balanced but Emma played well to be within touching distance of victory, only to be denied the match by some marginal refereeing decisions, allowing her opponent to come back into the game and level the match at 2 all. Taking strength from the previous game, O’Rourke pushed hard in the last game, eventually defeating Emma 11/3 in the fifth. 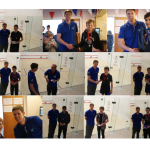 In what has to be the winner for match of the tournament, Alasdair Prott took on second seeded Conor Moran on the Glass back for the final of the boys under 15 event. The match had lots of twists, with Alasdair winning a hard first game 11/9. The Irish boy came back strongly though taking the next two games 11/6, 11/2. With momentum seemingly against Alasdair, and now two games to one down, things weren’t looking good. However, it was evident that Conor was finally slowing down and the work he was doing was taking its toll. Alasdair held his game together in a really professional manner, and closed out the match winning the next two games 11/3, 11/6. An excellent end to the tournament for Alasdair, who showed great maturity and composure throughout the event. Katie Gregson-McLeod had a momentous first game of her last match, losing it 18/16. Having got used to her opponent’s style of play she then adjusted her game well, won the next three games reasonably comfortably, and finished in a creditable 9th place. Maddie Orr had a bye in her last match so could have a relaxing Sunday, and finished 11th. Carrie Hallam met Suzanne Peters from the Netherlands in the 3-4 playoff and rounded off her tournament with a solid 3-0 victory to finish 3rd. Katriona Allen met Gemma Gillan from Ulster in her last match and played superb squash to win solidly, 3-0, finishing in 7th place. Fraser McCann had a good finish to his event despatching Aaron Lowrey from Ireland in a quick 3-0, finishing 15th overall, but still with another year to go in this age group. Beth Moglia and Jemma Young met each other in one of the first matches of the day, with Beth coming out victorious in this encounter, but Jemma took it all the way to the tie break in the third. 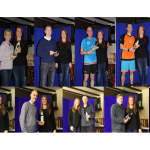 In Beth’s second match of the Sunday, which was effectively her second European final of the season after the Danish Junior Open, she came up against the diminutive but deceptive American, Lucy Stefanoni. Lucy, the younger sister of Marina that Orla had played earlier on, had won all of her matches with ease so far, so we knew it was going to be a very tough match in advance. Beth gave her all in the match and chased every ball down, but the American’s accurate drop shots and crosscourt drives proved to be just too much for Beth to handle, and she went down fighting in three straight games, finishing 2nd in the event. Jemma came up against a very strong Brenda Jiatong Li from Ireland in the playoff for 5-6th place, and fought well, but lost 6/11, 6/11, 6/11 to finish the tournament in a respectable 6th place. In almost the last match of the tournament, Patrick O’Sullivan met Richard Hollins in the 5-6 playoff, with Richard triumphing 3-1. In summary, a great tournament which provided our players with lots of valuable competitive experience, not to mention the Boys under 15 champion (Alasdair Prott) and four other podium finishes – Girls under 13 and 15’s runners-up (Beth Moglia and Orla Young) and Boys under 15 and Girls under 19 third places (Chris Murphy and Carrie Hallam)… bring on the Scottish Junior Open!